← Distracted by a digger. October is Pregnancy and Infant Loss month. October is Pregnancy and Infant Loss month. Everything is still a bit raw for us, but what’s become apparent is that parents who have lost a pregnancy, particularly in the early stages, rarely talk about their experiences. Perhaps this is one of the reasons the medical profession knows so little about why miscarriages happen. Big Poppa and I wanted to share our story because in our early days of loss the stories of others gave us some comfort. On the 26th of September, just one month ago, Big Poppa and I learned that we had lost our second pregnancy. The second off-spring we’d created hadn’t made it. The little heart stopped beating at about 9 weeks and 4 days. Although we shared our sadness with those that were close, we chose not to speak about it more widely. We had only been telling people as we saw them that we were expecting another Fearse. Only a handful of people knew, so in most cases we decided it would just be strange to announce that we’d had a miscarriage, when people hadn’t even learnt yet of the pregnancy. In most cases miscarriages seem to happen without any warning. In our case, I had never felt 100% certain about this pregnancy. The first pregnancy test came up negative. After a few more weeks, and a few symptoms, I took another test and it came up positive. In fact, it was so positive the second blue line showed up within about 10 seconds rather than the usual 2 – 3 minutes. At that stage we looked at our dates and it seemed that I was about 6 weeks pregnant. I booked in to see my doctor. We told our parents and a few close friends. We asked Little Fearse if she thought Mummy and Daddy should make her a little brother or sister. She said ‘no-no’ every time. We read articles about preparing older siblings for a new baby. We worried about the time and energy we would have to dedicate to our new baby, and wondered how Little Fearse would cope. We borrowed baby name books from the library and started negotiating names. Big Poppa went the usual route of trying to slip in obscure Muppet or wrestler names, to see if I’d notice. I usually did. We wondered how we’d fit yet another Fearse in the bed and started to think about offering Little Fearse her own bed. My body was starting to subtly change. At the doctors appointment, at 9 weeks and 4 days, the scan showed us a beautiful little bean, its heart beating strongly. The size, however, suggested the little one was only 8 weeks and 1 day. An earlier blood test had backed up that we should have been about 9 weeks pregnant. Our dates were 10 days different from the dates our doctor was telling us. I did all the calculations, but it just didn’t seem right. At that stage I began to wonder if the foetus wasn’t growing at the proper rate. Was something wrong? Two weeks passed. I had felt nauseous from a little before the second pregnancy test. I hadn’t wanted to eat anything, really. I was much more nauseous than I had been with Little Fearse. Suddenly, a week after our scan, the nausea stopped. Hey, so maybe I was 12 weeks pregnant, as matched my dates. I felt so much better. We left for a family holiday a little before the official school holidays began. On the Tuesday, a few days before we were due home, Big Poppa had to come back to the city to play a game of basketball. I took the opportunity to invite a friend and her son to visit. We spent the day at the beach. The kids explored all the different types of rocks and branches and seaweed and paddled in the small waves. That night both Little Fearse and her small friend decided to go to bed at the same time, which was all kinds of awesome in terms of having time to hang out with my girlfriend and catch up on months’ worth of half conversations, interrupted by the needs and noises of our little people. After putting Little Fearse to bed I went to the toilet and discovered that I was bleeding a little. I tried not to panic. I sifted through the catalogue in my mind of people who’d told me they’d had some spotting during their pregnancies. I didn’t want to ring Big Poppa, so far away, and worry him. I tried to put it aside. If this was happening, if my pregnancy was ending, there was nothing I could do to stop it. I told myself all the sensible things I could manage to tell myself. I tried not to worry. 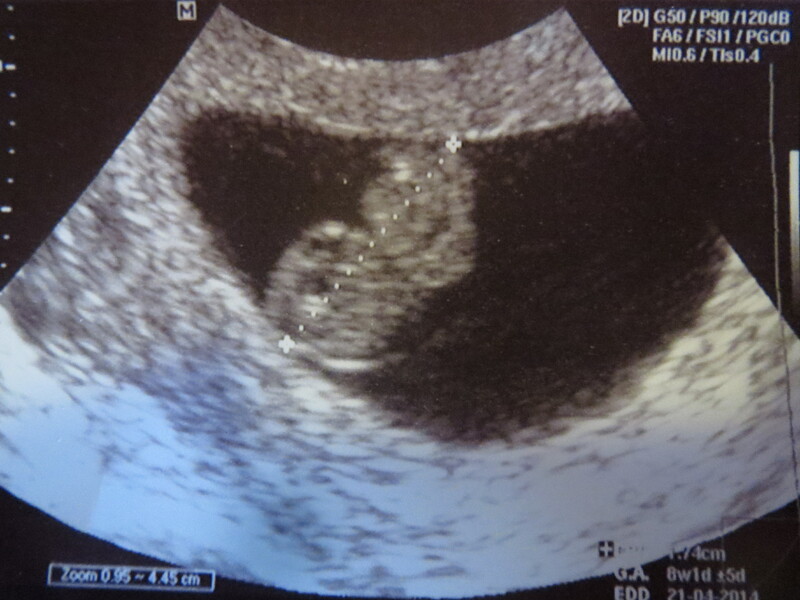 I didn’t really believe anything was wrong…well, except for all those misgivings I’d had since our first scan. They niggled away at me all night. The next morning I wasn’t bleeding anymore. Big Poppa returned and we talked. We agreed that nature would decide for us. If this wasn’t meant to be it was probably for the best, it was probably because this little one wouldn’t arrive healthy. We tried to remain calm, we decided not to go home early, we decided to put off learning for sure. The next day I was bleeding again. Not much. Not enough to have me really worried. I was sure it was nothing, but I was also becoming anxious to find out for sure. We came home from our holiday and I rang the obstetrician. They asked me to come in immediately. With no one to look after Little Fearse we took her with us. We had the scan straight away. Little Fearse was saying ‘baby’ and ‘car’ the whole time. I tried to focus on that instead of the concerned look on my obstetrician’s face. He showed us our perfect little bean. Its heart wasn’t beating. I could see it straight away, but I tried not to. I tried to unsee it. My doctor touched my shoulder and said he was sorry. Big Poppa and I looked at each other and had no words. I had a D&C that night. We wanted it to be over and behind us. We tried to be philosophical about it. We knew it was better for this to happen now than later in the pregnancy. We knew it wasn’t the worst thing that could happen. We knew it could happen to anyone, we knew it wasn’t anything we had done. We knew all those things, but what we didn’t know was that in a few days the grief would hit us. We’d both cry and neither of us would want to get out of bed for days on end. Little Fearse would be the one thing that kept us moving and we cherished her and held her close. No one knew what to say to us, except the Mums and Dads who have been there, too. And there were so many of them, people who we never knew had experienced miscarriages came out with their stories. We realised it was like a secret club, a club of parents who grieved in silence because it happened during the first 12 weeks, before we are supposed to share our joy. But maybe it doesn’t need to be like that. We decided to share our story, so maybe others can share theirs, too. Thank you, that’s so beautiful of you to say! At first I couldn’t speak about our losses but I didn’t want our babies to be ignored so we decided to be open about them. Sharing our stories is so powerful & I believe so helpful in the grieving, healing, letting go process! Thank you for sharing your story, my prayer is that our society becomes one that speaks openly of these things, that allows others to be open & honest of the hurt, the loss, the confusion, the grief, regardless of what ‘stage’ of pregnancy we are at. Our stories are powerful & help not just us heal, but others too! Our baby will forever be a part of our family, they may not have taken a breathe of air here on earth, but they took a piece of our heart when they left. I would love to share my story with you if you are interested. Sending you & your family loads of love & comfort! What a beautiful and honest post. Thank you for sharing! I had a very early miscarriage, 5 months before I became pregnant with Beanie. It was strange, because it was so early. I don’t think I had all the emotional issues that happen, after you’ve seen the baby on the ultrasound, etc. But it was hard, because we had been trying to conceive for 2 years, and, after that, we finally accepted that it wasn’t going to happen. I had accepted this so fully, that I didn’t even realize I was pregnant the next time, until I was nearly 10 weeks along! Thanks for your comment, Bethany. It really feels as though those who have experienced these losses and troubles are many, not few. Isn’t it amazing the way accepting something you want will never happen can sometimes bring it into your life? The mind is a powerful thing. I am so, so sorry for your loss. I don’t know what words to say as I’m sure there aren’t any that will ease your sadness. But thank you for sharing. It was a lovely post – a tribute to your little one. Hugs from Texas, USA. I’m very sorry for your loss. I’ve never lost a baby but have, of course, many friends who have and it so wonderful for them when they know others shared their experience, so thanks for posting. We lost our little one when I was about 7 weeks along, so far only my Fiance, his parents and his best friend know. My family has been having a rough few years so I didn’t want to burden them with my feelings so no one on my side of the relationship knows so I’ve only ever really talked to my Fiance about things. I wish my family was in a better place so I could speak to them about it but as my sister just lost hers at 8 weeks (and she’s been screaming at me that I’ll never understand) I don’t know if I’ll ever put it out there amongst my family in case it seems like I’m trying to upstage her. Thank you so much for posting this, this happened to me 3 years ago this November, so I wish the 21 year old me could have seen this post to know she wasn’t alone.